2007-08-08 Laurent Thorin, Haute Fidelite magazine Read More... "Le Trends TA-10.1 est donc une petite machine tres ludique qul vous depannera avec brio"
2007-07-28 Ghislain Prugnard, Prestige Audio Video Magazine Page 1 "Maise le TA-10 est incontestablement musical.."
2007-07-28 Ghislain Prugnard, Prestige Audio Video Magazine Page 2 "Maise le TA-10 est incontestablement musical"
2007-07-18 Michael Madsen, High Fidelity Magazine Read More... "Trends Audio TA-10.1 er et overraskende interessant produkt, der er i stand til at levere en fremragende lydkvalitet"
2007-07-17 Emidio Frattaroli, AVmagazine.it. 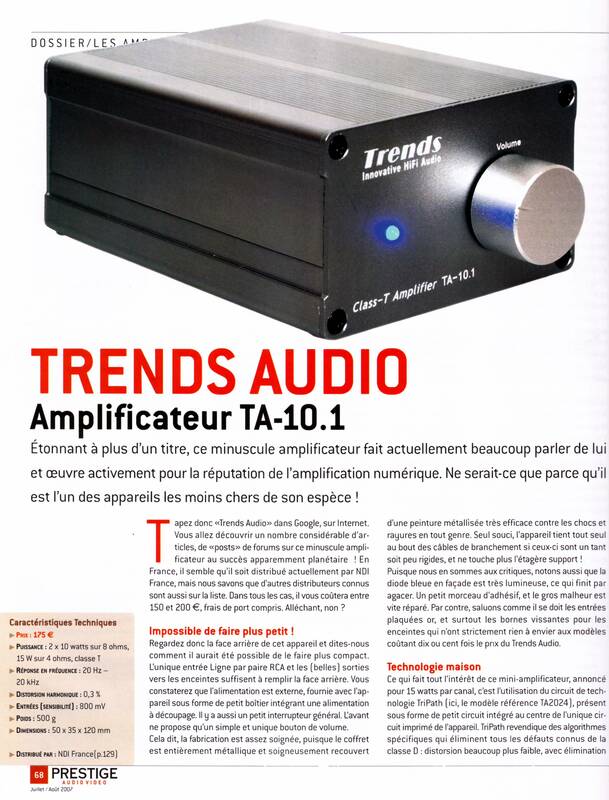 Read More... "del piccolo, meraviglioso Trends Audio TA-10.1"
2007-07-15 A. Colin Flood, EnjoyTheMusic.com Read More... "Good things come in small packages... is an excellent value in the right situations." 2007-07-15 Lucio Cadeddu, TNT-audio.com ! 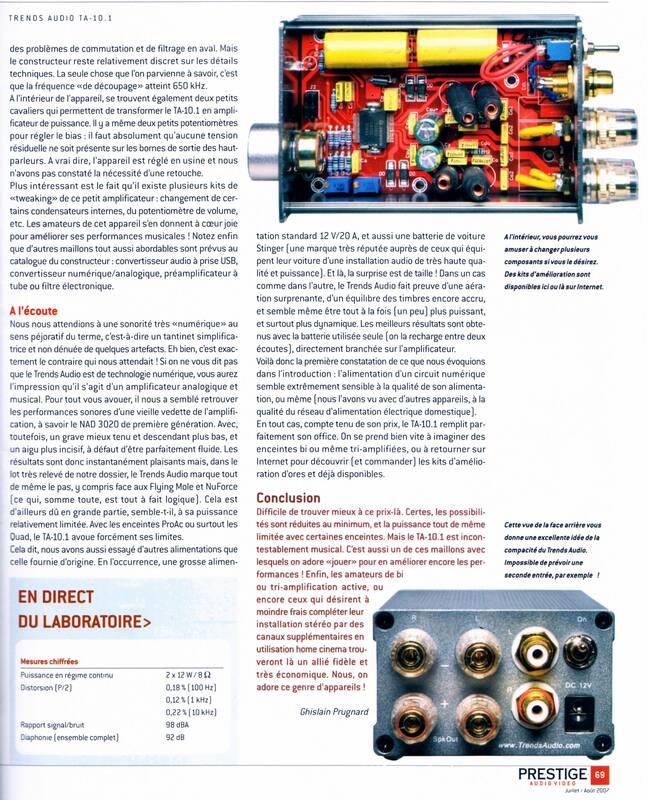 Read More... "this amplifier can be the heart of any high-end system...Recommended? No, you simply must have one"
2007-07-15 Lucio Cadeddu, TNT-audio.com ! (Italian version) Read More... "Raccomandato? 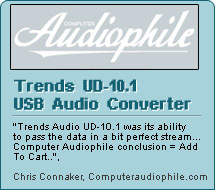 No, semplicemente dovete possederne uno"
2007-06-14 Stephen Mejias, Stereophile.com Review 2 Read More... "The little Trends amp surprised the hell out of me"
2007-05-29 Stephen Mejias, Stereophile.com Review 1 Read More... "Trends wants to attract more youngsters to join into the Hi-Fi field, then, again, I'm with Trends"
2007-05-28 Sasa Danicic, HiFi Cafe, Review 2 Read More... "Absolutely, Trends is one of the best Class T-amp in the market"
2007-05-25 Sasa Danicic, HiFi Cafe, Review 1 Read More... "Trends TA-10.1 is the revolution Hi-Fi product with affordable price !" 2007-05-24 John Sunier, audaud.com. 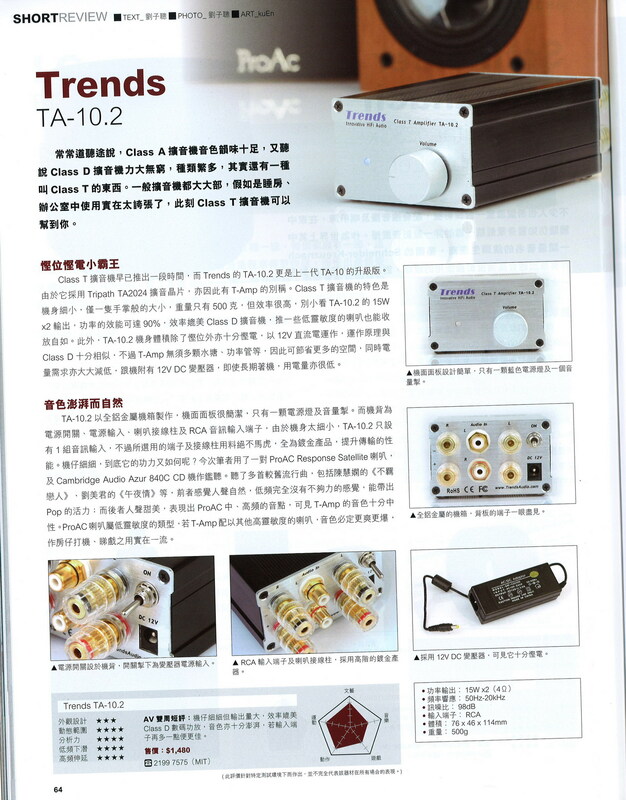 Read More... "The Trend was very clean and natural sounding." 2007-05-01 Roger Kanno, GoodSound.com. Read More... "a taste of the high end, and at a ridiculously low price..."
2007-03-15 Paul Szabady, Stereotimes.com Read More... "Making High Resolution Available to Everyone"
2007-02-18 Michael Mardis, Michael.Mardis.com. Read More... "the amp sounds very good, big and bold..."
2007-02-15 David Kan, 6moons.com. Read More... "Blue Moon Award for demystifying the high-end halo and bringing music back to earth... "